The thirteenth Annual Meeting of the Internet Governance Forum (IGF) was hosted by the Government of France at the headquarters of UNESCO in Paris from 12 to 14 November 2018. The Internet Governance Forum serves to bring different stakeholder groups together as equals, in discussions on public policy issues relating to the Internet. While there is no negotiated outcome, the IGF informs and inspires those with policy-making power in both the public and private sectors. At their annual meeting, delegates discuss, exchange information and share good practices with each other. The IGF facilitates a common understanding of how to maximize Internet opportunities and address risks and challenges that arise. As a platform for discussions, the IGF has identified a number of issue at global and national levels over the years and shaped policy decision's related to ICTs. This year’s IGF is part of France’s “Paris Digital Week” alongside the Paris Peace Forum and GovTech Summit from 11-14 November 2018. 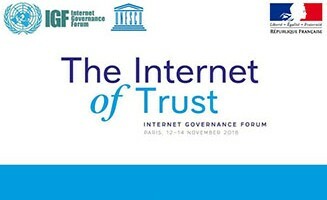 In the framework of the IGF 2018 edition, held under the theme “Internet of Trust,” UNESCO will organize a number of workshops, open forums, and side-events open to registered participants.